Perennial. Zone 1. Rosaceae. A.k.a. 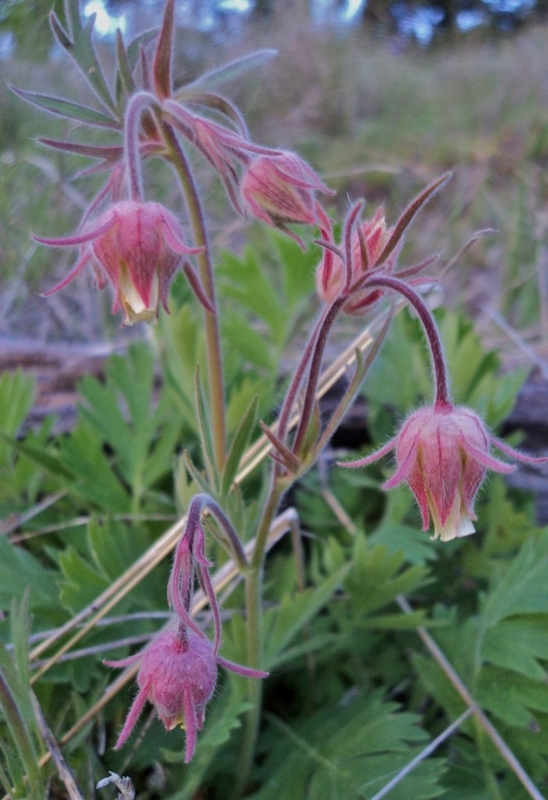 PURPLE AVENS, THREE-FLOWERED AVENS, OLD MAN’S WHISKERS. Native to a large area of North America, from British Columbia through the prairie provinces, as far south as California, and eastward across the northern United States. Geum comes from the Latin name gaeum, “a plant with aromatic roots” which is derived from the Greek geno, “to yield an agreeable fragrance”. Triflorum = three-flowered, from the habit of the blooms to appear in clusters of three. 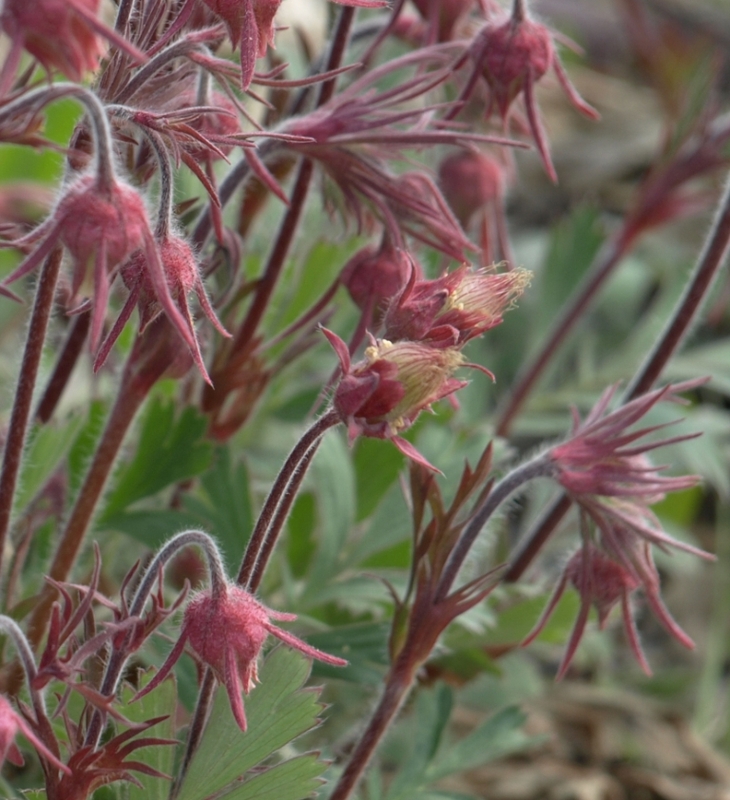 One of my favourite spring wildflowers, this pretty plant flourishes from the dry hillsides of the Cariboo to the prairie grasslands east of the Rockies. It happily adapts to the garden, and I always enjoy meeting it unexpectedly, flourishing in alpine and botanical gardens in its quiet way, as content to be treated with care in a plant collection as it is on the rocky slopes of the higher points of Hill Farm. 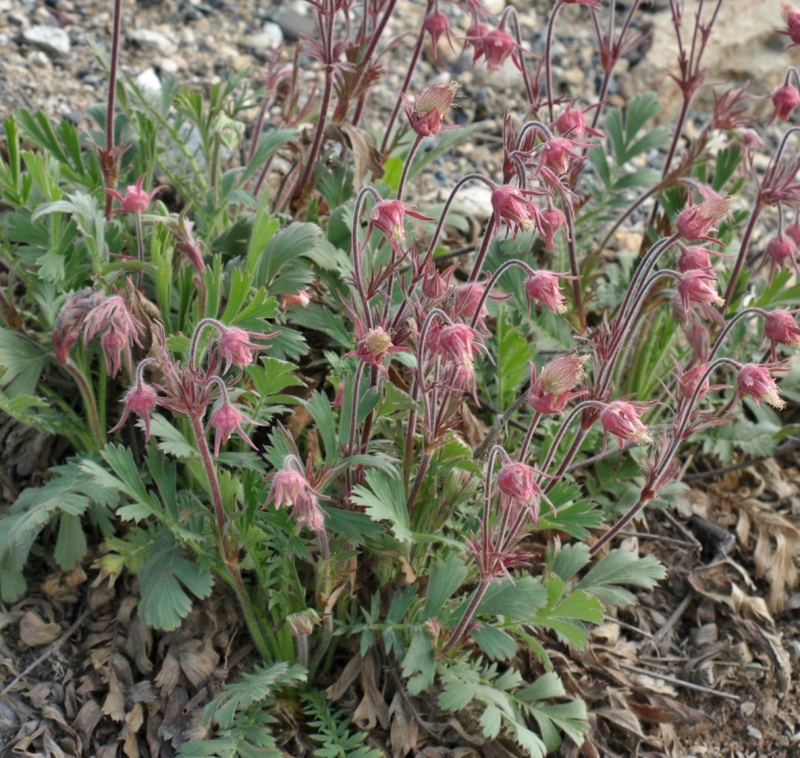 According to Plants of Northern British Columbia (1992: MacKinnon, Pojar, Coupé), Geum triflorum was used by the Thompson and Okanagan First Nations people to make a root tea for treating colds, flu and fever. The Blackfoot in Alberta were reported to use the crushed seed as a perfume. Tidy clumps send up multiple 6 to 12 inch tall stems topped by triplets of dusky pink, nodding, bell shaped blooms. These never properly open, but are sought out regardless be tenacious early-foraging wild bees, which force their way into the downfacing bells. The insects’ great pollinating success is evident by the profuse seed heads which develop a little later. These seed heads are Geum triflorum’s main attraction, and its showiest feature in June and July. Large, feathery, often spiralled, and very long lasting, they are prettily blushed with pink, which makes a delicate contrast to the soft green of the developing seeds at the centre of each cluster. Foliage is softly downy, a gently sage green, and rather ferny in effect. It forms basal clusters, and stays attractive all season, eventually blushing rich red in autumn. Nodding Avens has a rhizomatous root system, and gently spreads to form a generous colony where happy, but is never invasive or ill-behaved. Very nice for spring and early summer interest in the rockery or at the border front. Very good on slopes. Best in sun but will tolerate light shade. Very adaptable to all sorts of soil. Very drought tolerant, but appreciates some extra moisture at the peak of summer.